Ready, set, go! Don’t miss the festival fun – here’s the ultimate Coachella party guide. Some of these are invite-only — but who knows? Strike up the right conversation with the right person and you might end up somewhere great. FORAY Collective, the shop by style influencer website will host its inaugural poolside bash, FORAY Oasis, from 12pm - 4pm at a private estate in Indio. Expect top see style influencers like Rocky Barnes, Evelina, Kaitlynn Carter, Jill Wallace, Paola Alberdi, Jessi Malay and Cara Santana grooving to beats by Amy Pham and Brody Jenner. BE SOCIAL will host a beauty oasis, that will feature beauty services exclusive to those attending the poolside bash.This event is strictly invite-only. Stop by the Ace Hotel & Swim Club, which is hosting Desert Gold, April 14-17, with experimental performances and meditation workshops from the David Lynch Foundation — plus many live bands and DJs. Free event, open to the public with RSVP. Desert Beach Party at The Base Camp (a new RV and camping experience this year) is hosting lake and pool parties noon to 6pm April 15-17 with curated DJ sets and hot air balloon rides. Free event, open to the public with RSVP. For a serious case of pool partying, head to the Day Club Palm Springs at the Hilton pool in Palm Springs. DJs will be spinning back-to-back April 15-17. Open to the public with ticket purchase or VIP cabana reservations. Amuse Society is hosting a festival house kick-off party at a private estate in Palm Springs from 12-4pm. Expect Joico hair station, Moet mimosa bar and festival cocktails by SVEDKA Vodka while jamming to Sam Black’s tunes. Private event, by invite only. BISOUS magazine is hosting an exclusive fete with influencers, entertainment and fashion industry IT girls and guys to a day of relaxation, shopping, beauty, award winning food, and libations at a private estate from 12pm-5pm. Private event, invite only. Vestal Village a living environment for VIP campers hosts daytime pool parties April 15-17. Amenities include: horseback riding, welcome gifts, lakeside performances, pop-up restaurant, and hosted bar. This is just about the only pet-friendly party. This is a private event — submit invite request here. Boho brands Cleobella and Vanessa Mooney are throwing a kick-off party at a Palm Springs residence from 10am-3pm. Private event, by invite only. Wildfox x The Audience day party will have special live performances, on-site art installations, and DJ sets by Tasty Treat, Sam Black and Vanessa Michaels from 12pm-6pm at a private estate in La Quinta. Invite only. Pandora shows up in the desert for the third time with their Indio Invasion party. Poolside treats and beats, with a DJ set from Walk The Moon from 1pm-4pm. Free event, open to the public with RSVP. Revolve is throwing a super VIP two-day party from 1pm-6pm with special performances, DJ sets, food trucks, and festival games with a Birchbox beauty bar on site. Private event, invite only. The Zoe Report holds its second festival retreat – ZOEasis in a private residence. This exclusive event will be hosted by Rachel Zoe and TZR and will feature a DIY denim bar by GUESS, spin-art by Superga and a braid bar by Batiste. Invite only. 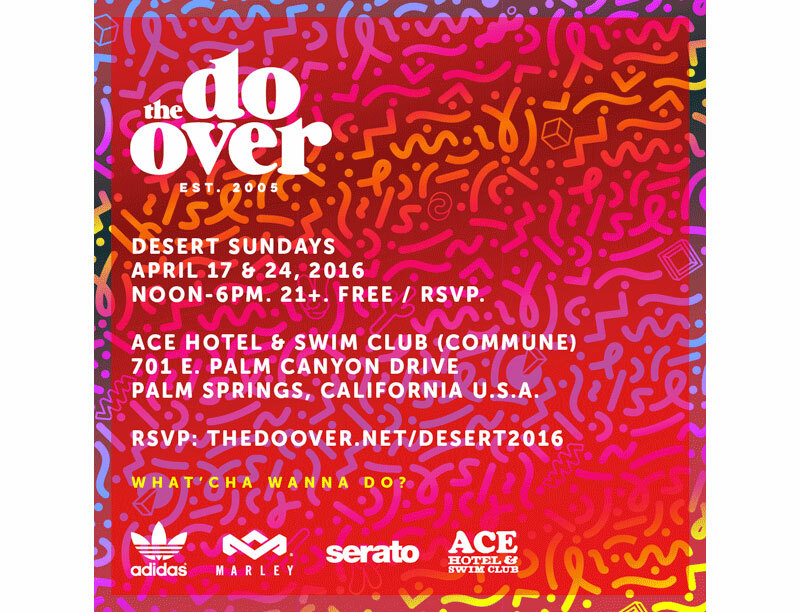 The Do Over partners with Adidas and more to host one of their legendary parties at the Ace Hotel and Swim Club from 12pm-6pm. Open to the public with RSVP. From 11am to 3pm, Racked LA will be hosting a Wellness Oasis for VIP guests. Attendees will be treated to cold-pressed juices by Clover, healthy cocktails by Belvedere Vodka and Gran Cosecha Tequila, a detox stretch session hosted by How You Glow, organic makeup touch-ups by Juice Beauty, braids and hairstyling by GLAMSQUAD, and a full gourmet lunch spread. Private event, by invite only. NYLON magazine is back with a pool party and brunch with the best tunes, cocktails, and gift bags. Private estate, 12pm. Invite only.